The only 4-corner adjustable suspension system.Dual A-Arm with exclusive top mounting-point adjustability. Adjust to softer setting for trail riding or stiffer for heavy-duty work. Front: 9.6″ suspension travel. Rear: 9″ suspension travel. Cab ergonomics deliver outstanding driver and passenger comfort, including tilt steering with the highest range of motion (10″), extra legroom, and easy cab slide-through design for three adults to get in and out quickly. Pallet-size rear dump box has gas-assist dumping operation and features exclusive Lock & Ride cargo system that accommodates many hard-working accessories that go on and off in seconds.Models approved for sale in California are limited to 600 lbs cargo box capacity (rear payload capacity per CARB classification) and1100 lbs total vehicle payload. 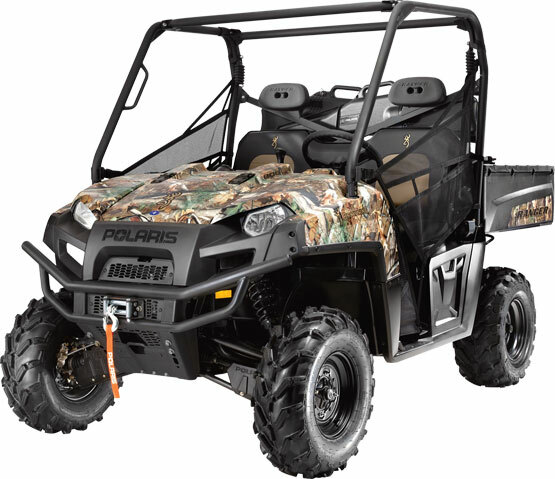 In rough terrain, our legendary smooth IRS and a full 12″ of ground clearance combine to keep the ride smooth for you and your passengers, as well as your gear and equipment. The strength to tow 2,000 lbs., far more than the competition, means you can tackle the toughest jobs with confidence. Features a standard 2″ hitch receiver.